Fantastic drawing of tournament bracket provided by Northbridge High School Lacrosse. It's Selection Friday for high school lacrosse here in Massachusetts, and the MIAA has set the draw for the CMass Tournament. Well, sort of. 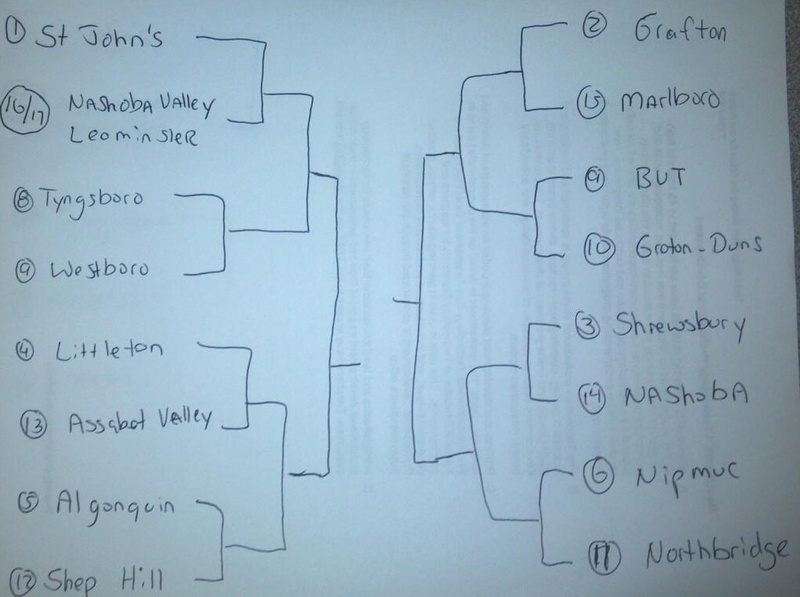 The actual brackets with times and dates are not up on their website yet, but here is a beautiful drawing of the CMass bracket from Northbridge Lacrosse's twitter. I assume the artist we can thank is coach Steve Falconer, but I don't want to jump to any conclusions. Anyways, here are a few thoughts on the bracket. Mostly because these two teams will (presumably) have to face each other in the second round. St. John's is the unquestioned No. 1 in Central Mass, but Westboro dropping all the way to No. 9 due to overall winning percentage hurts both teams. The Rangers are considered one of the five best teams in Central Mass. I thought they'd fall somewhere between No.6-8, and I was hoping for six so they could meet a team like Shrewsbury in the second round. Those two teams split their regular season series, and it would be great to see them go Round Three. Instead, you get the top team in the region having to play the toughest second-round game and a dangerous Westboro team having to play on the road at Tyngsboro and then against the regional favorite. Clearly, overall strength of schedule (and not just wins over tournament teams) should be considered a little bit more when making these brackets. Shrewsbury is dealing with a bunch of injuries, and their last meeting with Nashoba was a tight 9-8 win for the Colonials. The Chieftains are only 9-9, but they've played everybody close lately, and their combination of Trevor Pilkington and Kyle Elkins can score on anybody. Add in the unique abilities of Mike d'Entremont (a powerful offensive lineman on Nashoba's championship football team) and the Chieftains will be a handful for a beaten up Colonials squad. I'm also interested in whether or not Northbridge can knock off Mid Mass rival Nipmuc. The Rams lost both games this season to the Warriors, but were able to contain Nipmuc's offense and leading scorer James Broomfield. Problem was, the couldn't score themselves, as the Rams accumulated a total of six goals in their two meetings. But, it's a new season, and Nipmuc hasn't looked nearly the same since its 11-0 loss to Grafton in early May. Anything could happen here. As the playoffs go on, I'm sure we'll be talking about players from bigger schools, but I am really curious how Johnson will play against better competition. Say what you want about Littleton's strength of schedule, and them being ranked too high at No. 4, Johnson scored 100 points this season (47G, 53A) to lead CMass, and I want to see what the kid can do in the tournament. If the Tigers can get by Assabet (Not as easy as you might think), we will likely get to see what Johnson can do against a fantastic Algonquin defense. Sure, asking him to lead Littleton to a win over the T-Hawks is a bit much, but it will be interesting to see what he can create against a top-flight program.